Plants with twigs or trunks or have a woody stem or stem base, and plants that are related to them. Scientifically called Arborescent Flora. Includes Conifers, trees with needle like leaves bearing cones; Heaths and Heathers; Broadleaf, Deciduous and Evergreen Trees and Shrubs; common Palms and some Street Trees and Ornamentals. 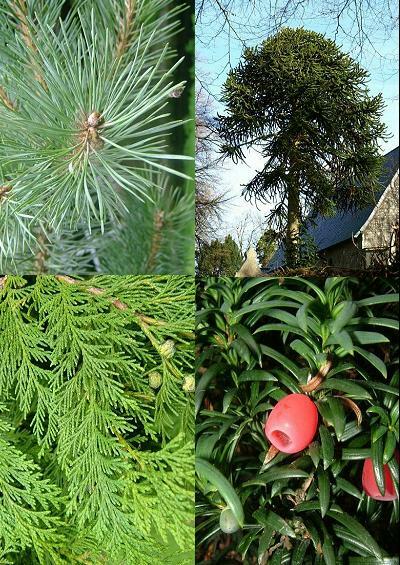 A group of cone bearing largely evergreen trees and shrubs posessing needle or scale-like leaves. There are very few native coniferales in the UK so most species included in this section will be alien species that would have been imported for amenity / ornamental value or commercial use in forestry. Native woody plant families, trees and shrubs. Listings may also contain related non-native, alien, or ornamental trees and shrubs from the same family. e.g. Sapindaceae (Maples, Sycamores and Chestnuts) only contain one native species but are included here. This section contains most of the most commonly seen native and ornamental trees. Alien or ornamental tree and shrub families containing no UK native representatives, although some of the families included may be represented in the UK by native non-woody species of plants, see Dicotyledons. This section contains more alien species of shrubs than the section above and non-native commercially or garden grown fruit trees. Many of the species here will be recognised as street trees or ornamental shrubs and can be seen in most parks and gardens. Some may also be found self-seeded or planted in various locations.